MOSFETs are small electrical components that, with other components, make up the VRM. Did we just confuse you even more? OK, let’s fix that. VRM, or Voltage Regulator Module, as its name would suggest, is the part that regulates the voltage for the most important components, such as CPUs and GPUs. We all know that your PC runs on classic power supplies, and some of you probably know that they can produce only three constant voltages which are 3.3V, 5V and 12V. The important bits in a computer, like the CPU and GPU, usually have the operating voltage between 0.5 and 1.5 volts. So, if a CPU or GPU need something around 1V, you can see the problem that we are facing – higher voltages need to be converted to lower voltages. The part that does the converting is called the DC-DC converter, and unsurprisingly, it converts direct current to another direct current. To be a bit more specific, a higher voltage needs to be converted to a lower value, and the DC-DC converter we are interested in, is called a step-down (buck) converter. As always, we are going to be brief and blunt with our explanation. 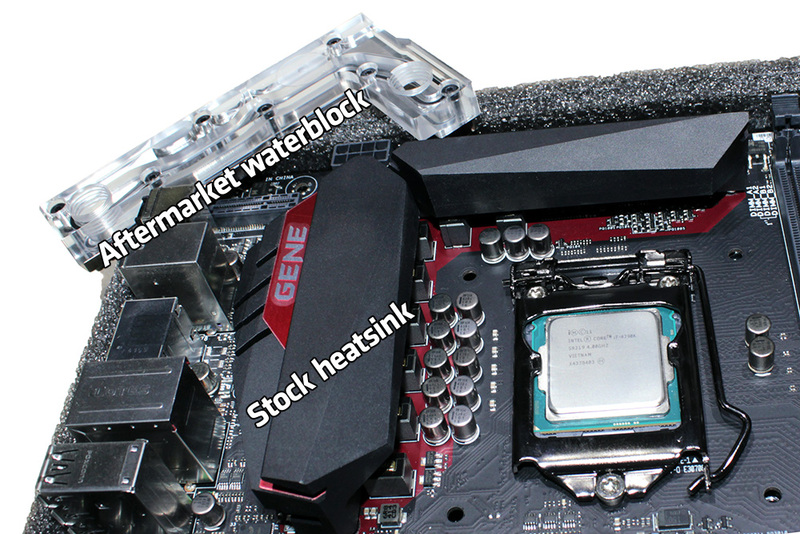 Almost every higher end motherboard has an elongated heat sink near the CPU socket. This is for cooling the VRM section, or to be more specific, to cool MOSFETs themselves, which tend to get really hot. Peak temperatures can range from 80°C to 100°C and in cases of high-end graphic cards, temperatures can be even more extreme, up to 120°C. Why do we need to cool these parts, what is the benefit of it? MOSFETs have an efficiency factor and they pass through high currents. All electrical loss is converted to heat, and the heat generated by the whole VRM can almost directly be linked to the efficiency of the MOSFETs being utilized. 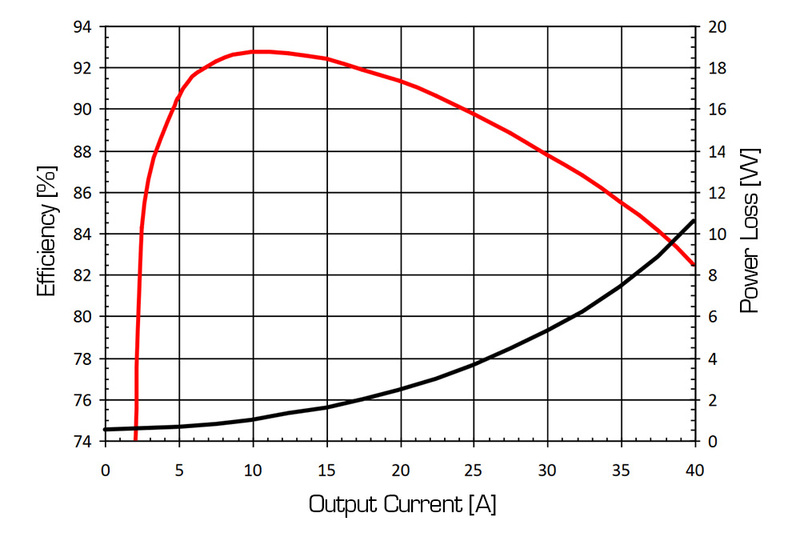 The efficiency of a MOSFET is always presented by a curve which depends on the amount of current passed through and of course the quality of the MOSFET itself. Efficiency graph of a MOSFET used on the Gigabyte Z97X-SOC Force motherboard. The high workload on the CPU or GPU and overclocking, makes the MOSFET in the VRM hot. So, if you want to work in a stable environment, have a safe overclock or just want to prolong the life of your hardware, you need to keep that VRM cool! The VRM is a sort of DC-DC converter which is composed out of three main parts: the logical unit, the power unit, and the filtering section. Example of 8 phase VRM on an X99 based motherboard. The logical unit is made up of one (rarely more than one) chip that is called the voltage controller or the PWM chip, or the Pulse Width Modulator. 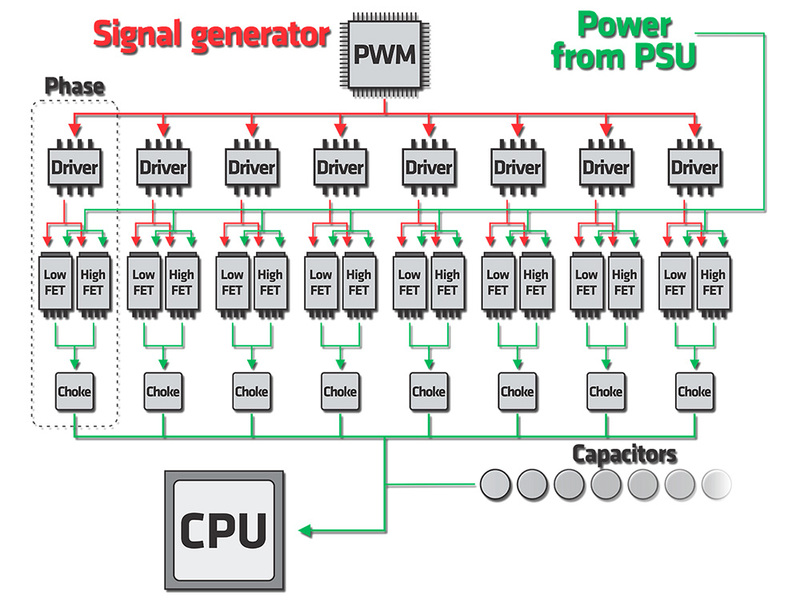 The role of the PWM chip is to govern the drivers and doublers (if they are present). The drivers and doublers are connected to the MOSFETs and they are all part of the power unit. The final section of the VRM is where the filtering and voltage smoothing is done. This is happening through inductors, that are popularly called chokes, and capacitors. A set of drivers, MOSFETs, chokes and capacitors make up a phase of the VRM. The quality of the motherboard is often expressed by how many VRM phases it has. In the case of the CPU, the whole point of the voltage regulator is to take 12V from the 8-pin EPS connector and step it down to 1.2V (the stock voltage for most Intel CPUs), and that is done by pulsing the current trough each phase of the VRM. Schematics of an 8 phase VRM. This is a block diagram of a VRM that has eight true phases and the dashed line marks what is supposed to be one individual phase. Usually, by counting the number of inductors (chokes), you can determine how many phases VRM has. The number and type of capacitors does not follow any rule and is set by the manufacturer. 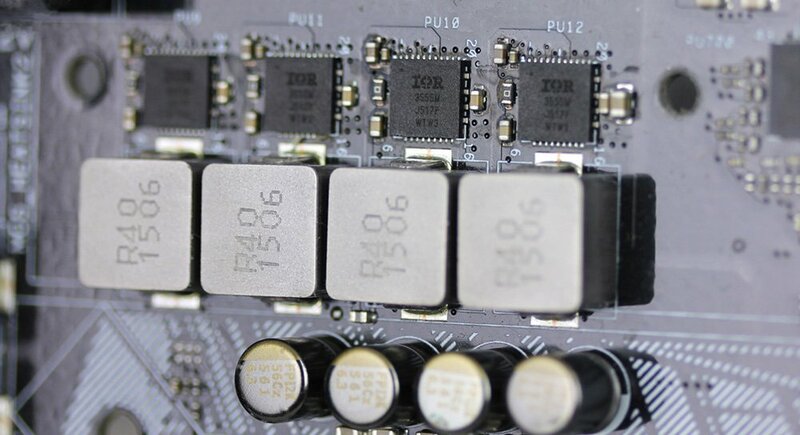 Some high-end solutions even implement different types of capacitors to filter the power that is delivered to the CPU. MOSFETs, or Metal-Oxyd Semiconductor Field Effect Transistors, are basically tiny switches. MOSFETs are governed by a high-frequency signal that comes from the PWM unit. In a nutshell, MOSFETs turn on and off rapidly, passing trough high current in short pulses. By combining these pulses in more VRM phases, the current for the CPU/GPU will be more smooth and stable. We also talked about MOSFET efficiency earlier. The higher the current, the hotter the MOSFET gets. If it gets hot, it affects the resistance of the semiconductor, the efficiency drops and from there it’s a never ending loop that will only generate more heat. The design of VRM MOSFETs can vary, but they all have the same function, so we think it’s not necessary for us to go that deep and start explaining some advanced electrical engineering. The important bit that you need to know, is that the voltage conversion starts at the MOSFET and it is handling the biggest workload. The factory cooling on these components can „do the job“, but as we discussed in one of our earlier articles, water cooling is more efficient. Classic air cooling is often trying to cool the key components, but mostly it just recirculates hot air inside the computer case. Liquid cooling on the other hand, transfers the heat away and dissipates it through the radiator. To keep MOSFETs cool, EK started to design special motherboard Monoblocks, where the CPU water block and MOSFET water block is combined as a unified solution. You can see the current selection of the EK Monoblocks here. 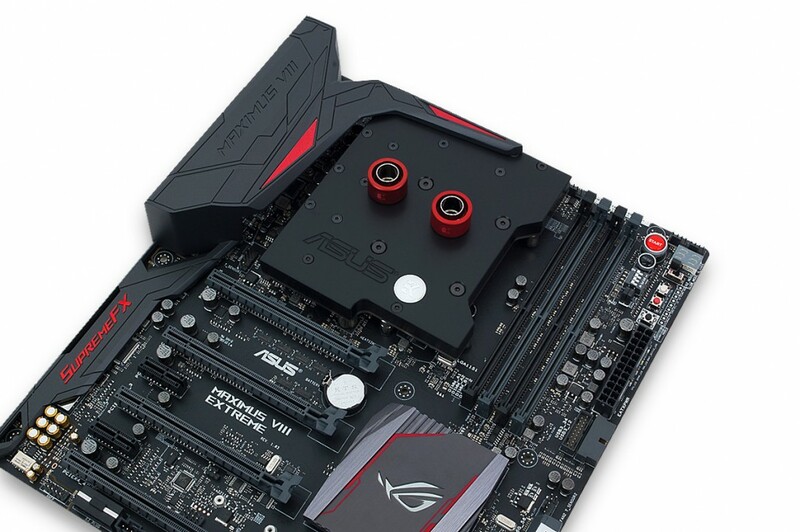 EK-FB ASUS M8E Monoblock for ASUS MAXIMUS VIII Extreme motherboard. Every Full-Cover GPU water block produced by EK, also covers the entire PCB of the graphics card. GPU, RAM as well as VRM (voltage regulation module) are cooled down as water flows directly over these critical areas. EK-FC1080 GTX with NVIDIA GeForce GTX 1080. It’s funny that some manufacturers secure the removal of the original air cooler that is inefficient and often goes bust. On the other hand, if a stock cooler is replaced with liquid cooling, it could ensure a longer life for your hardware. We hope that we have shed some light on one of the key components that make our precious hardware run, and it’s the VRM with its MOSFETs. Until next time, stay cool! 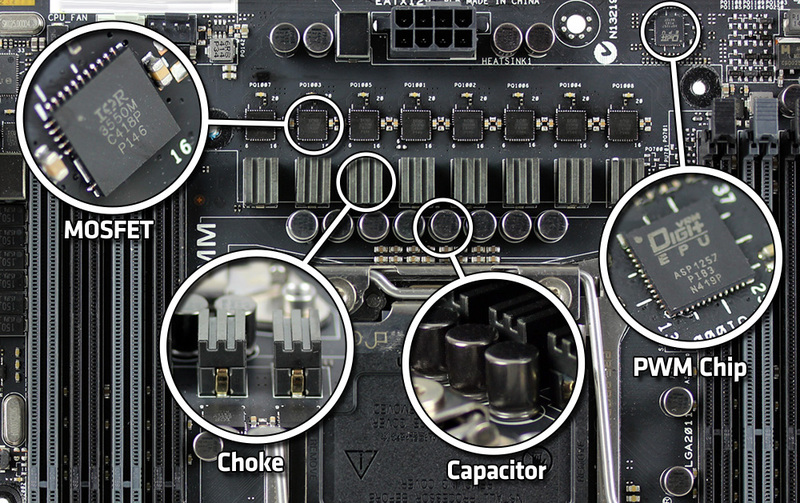 The best article about motherboard VRM I’ve read, good job!